Thai Thai is a same same but different hole-in-the-wall joint with a solid Thai following on Botany Road Alexandria/Redfern. Our friend Rohan is a used idea salesman. He has a beard and listens to ABC Radio National. Most of his used ideas are of an abstract scientific nature or involve drinking until falling down. 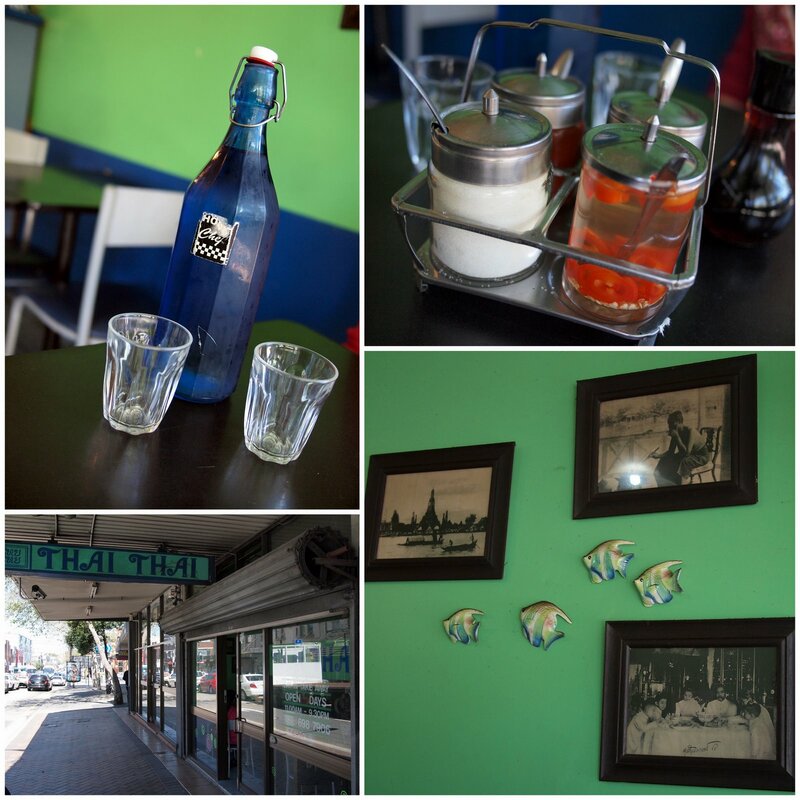 But occasionally he comes up with something useful, such as trying out Thai Thai on Botany Road in Alexandria\Redfern. I did a reconnaissance walk-by the other day and liked what I saw: Thai Thai is a tiny hole in the wall joint with lots of Thai customers, menus written in Thai as well as English, pictures of the king on the wall and an assortment of ready-to-go Thai desserts and condiments on the counter. Is there any place more Thai than Thai Thai? A week later we have a rare spare Saturday and walk over for a feed. We step inside and a glorious smell makes me smile from ear to ear: the smell of boat noodle soup... We sit down and the happy chatter of Thai folks, the busy traffic outside and the warm weather transport me back to Thailand, for an instant. 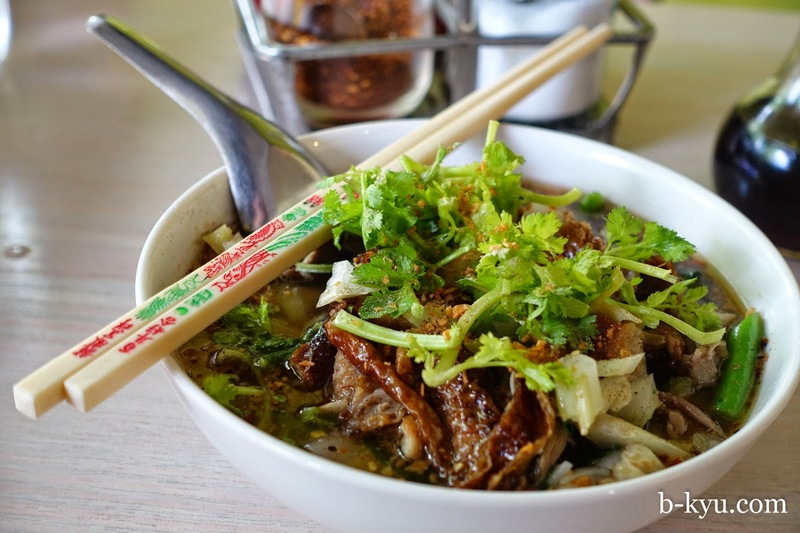 Beef Boat Noodles Soup - Small $6.00 - Large $9.90. Delicious, viscous, sweet, beefy broth cut with lime. Rice noodles with nibbles of beef and veggies. A Bankgok street food classic. Lafawnda chooses Kuy Kub - Rice noodles special soup with egg and pork stuff - $7.90 - Large $10.90. The broth is amazing, light yet rich and sweet. 'Pork Stuff' includes intestines. Both of these soups are fantastic and we really appreciate them offering small servings. The small servings are of similar size as to what you would get in Asia, enough to satiate the appetite and not leave you full or feeling heavy, with plenty of energy to keep on with your day and plenty of belly room left for further snackage.We wish more joints would do this. BBQ Duck Fresh Rolls - $6 for Two. BBQ duck fresh rolls are duck and shallots with hoisin sauce wrapped in pancake. These are similar to Peking Duck pancakes, we wonder why more restaurants don't do this: it's easy to make utterly, utterly delicious. Duck noodle soup - flat rice noodles with a few duck pieces, a couple of blood jelly cubes (these are easy to avoid if you don't like them) and veggies in a lovely dark sweet broth cut with lime. Fantastic. Pork (or chicken) noodle soup - stir fried pork mince and some pieces of crispy pork belly with vermicelli noodles in slightly hot and sour soup, with strong lime flavours. Awesome. 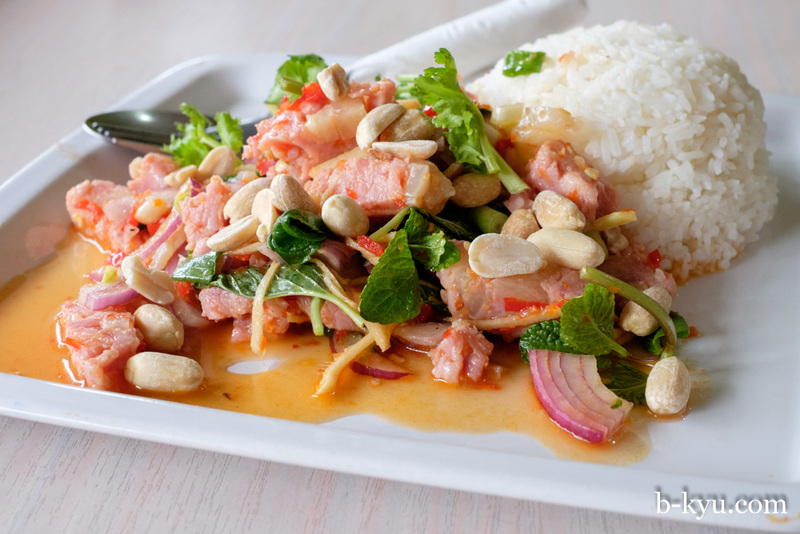 Reminds us of the wonderful soups at Doo Dee Noodle Bar in Bondi Junction, another of Sydney's top notch Thai street food joints that barely scrapes a mention in the foodie press. 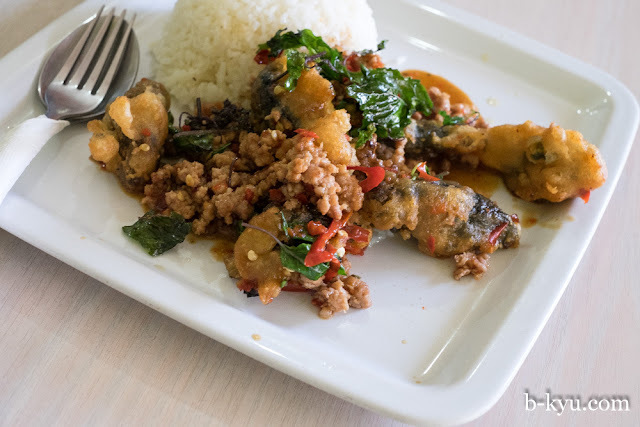 Kuy Jub - another Thai street food classic with pork mince, crispy pork, some kind of lovely simmered pork and some ofal, with flat rice noodles and a thin sweet and lightly spiced broth. Mr Shawn doesn't really like ofal but this still has him dancing all the way back to the office. Thai Thai's version of Boat noodle soup is even better than remembered - a dark sweet beefy broth cut with lime given a kick with some spices, a little stewed beef, a couple of beef balls and wonderful veggies. Hoochimama this is good. Thai Thai is Mr Shawn's pick for duck noodle soup. A small bowl ($8.50) is plenty big for lunch. A dark sweet ducky broth with chili and garlic, shreds of roast duck and rice noodles. The aunties doing the cooking at Thai Thai aren't getting any younger. Serious Thai food nerds should try this place sooner rather than later, you never know when they will hang up their woks. It's tempting to get the same favourite dishes over and and over but sometimes you gotta branch out. Mr Shawn tries the pickled pork salad ($14.90 or $10 as a luch special with rice as above). It looks so fresh and lively, like it goes to leap off the plate. The pink piggy bits are preserved swine, they look raw at first glance but it seems to be some kind of luncheon meat or sausage, with peanuts chili fresh herbs and fishy dressing. Century egg with chili and basil - $13.90 (done as a lunch special with rice). The preserved eggs are deep fried which makes the funky salty egg flavours much more gentle. The eggs are mixed in with mince, chili and basil. The mince was a bit sweet making the dish not as magic as the pickled pork salad, but still a great lunch and something a little different. Hey, they've updated the signage. Thai Thai has been around since 1989 and serves some great Thai street food specials that are hard to find elsewhere, as well as the more standard Aussie Thai fare. Thai Thai may be a disgrace to the Pun Restaurant Name Association but we love it. 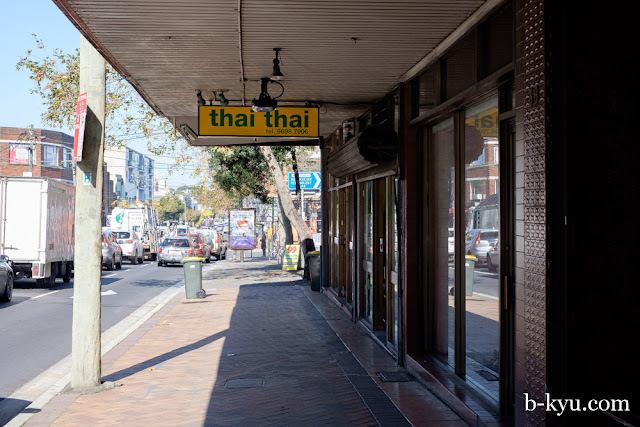 Thai Thai is at 40 Botany Road Alexandria, a couple of doors down from the magnificent FBI Radio, near the corner of Henderson Road\Raglan Street. Open 11am - 9.30 pm daily. Ph 9698 7906. We're fans of the Cockatoo Bakery a couple of doors up, give it a whirl too! We plan to work our way through the specials section in the menu below (except for the pink noodle soup), we'll add more pictures over time. Thai Thai Menu - Click To Enlarge. A quick snap of the Everleigh markets on our way home, everybody looks so happy. I came to get a glance of my foodie hero Kylie Kwong but alas she is not here, but we do find a great beef motorbike, I mean murtabak from the Indonesian stall right at the very end. $4. why not the pink noodle soup??? Never made friends with pink soup. Ecchhh. It's yen ta fo right? Fermented soy bean and blood soup I think. Yes, red fermented tofu. We ended up eating a couple on our last trip to Thailand and I think Shawn might be reformed now. After reading this a while back, I now go here regularly. The noodle soups are incredible.